I'm looking for a flight, Bucharest - Buenos Aires for 3rd of January 2019. I found some flights with layovers but I don't understand the time and date on them. The first part. It arrives in Nice at 10:10 AM and it has a 2h30m layover so it should take off at 12:40 PM but instead it says 3:55 PM. Also the second one, if it arrives at 2:20 PM and has a layover of 7h40m it should take off at 10:00 PM. Did the mixed up all the timezones? Here is the link of my search. Seems like a bug: the departure and arrival times are swapped. So it arrives Nice at 11:40am and departs 2:20pm which is indeed 2:40h layover. AF 661 departs OPT at 10:10am and arrives Nice at 11:40am. As someone who’s been working with Skyscanner data for Flightbot (https://flightbot.com), I can assure you that the data from Skyscanner (and other sites for that matter) are often flat out wrong. Their data is only as good as their sources. 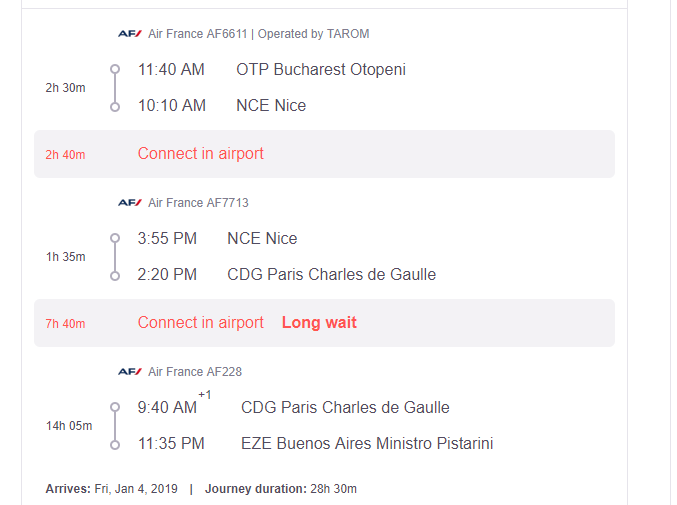 Searching for this itinerary (Bucharest through Nice), this itinerary is totally flubbed. The first flight should be 10:10 to 11:40, not 11:40 to 10:10: https://www.google.com/flights#flt=OTP.NCE.2019-01-03.OTPNCE0RO401;c:USD;e:1;sd:1;t:f;tt:o;sp:.USD.11965; similarly, the other flights’ times are all reversed. Even flight search engines make mistakes! Not the answer you're looking for? Browse other questions tagged layovers flight-search-engines connecting-flights timezones or ask your own question.